Landmarks considered eclectic mix of architectural styles built over the last two hundred years. On June 22, 2010, Landmarks held hearings on eleven potential individual landmarks in Manhattan and one in Brooklyn. The buildings under Landmarks’ consideration were all built between 1800 and 1971 and represent a range of architectural styles. The buildings included the Modernist Japan Society Building on the east side of Manhattan, a Spanish Baroque Revival theater on Canal Street, and a Federal- style house in Tribeca. The Japan Society Building at 333 East 47th Street in Manhattan’s Turtle Bay received praise from preservationists. The Junzo Yoshimura-designed building was built in 1971 on land donated by John D. Rockefeller III. Yoshimura, a Tokyo resident, was one of the first prominent Asian architects to see his work built in the City. The building fuses Japanese tradition with modernism and was built using a variety of materials, including bronze and concrete. The building’s black facade is detailed with slatted window screens and latticework along the street. Thomas W. Lamb built the Loew’s Canal Street Theater at 31 Canal Street in Manhattan’s Lower East Side in 1927. Although known as a prolific theater architect, Lamb also designed the landmarked Paramount Hotel. 6 CityLand 173 (Dec. 2009). 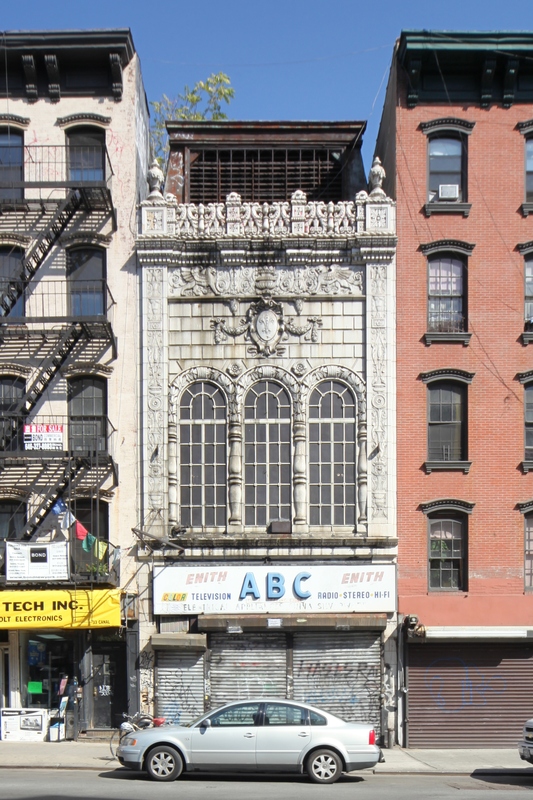 The theater’s narrow, threestory front facade features terra cotta ornamentation in the form of sea serpents and griffins. Loew sold the building in the 1960s, and it was converted into an electronics store. The Shiloh Company LLC opposed the potential designation of its three-story house at 177 West Broadway in Tribeca. Landmarks’ staff said the building, built in the early 1800s, was one of Tribeca’s earliest buildings and one of the few remaining Federal-style houses in Manhattan. Kramer Levin attorney Valerie Campbell, representing the owner, argued that the building had been significantly altered and only possessed “a fragment of its original historic fabric.” Campbell said the building’s original ground floor facade had been reconstructed and that the third floor dated from the 1890s, leaving only a “single ones-tory swath of original brick.” She argued that the building lacked the pitched roof and dormers that characterized Federal-style houses. The Society for the Architecture of the City’s Christabel Gough asked Landmarks to keep the record open so that the Society could research the owner’s claims. Chair Tierney agreed to leave the hearing open for 30 days. LPC: Japan Society Building, 333 E. 47th St., Manhattan (LP-2420); Loew’s Canal Street Theatre, 31 Canal St., Manhattan (LP-2368); 177 West Broadway, Manhattan (LP-2347) (June 22, 2010).